Uloboridae is the only spider family without venom. 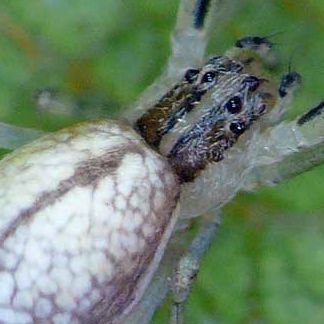 They are usually very small, widespread, diverse and common, especially around houses, but they can also be amongst the most numerous spiders in foliage, where they spin small orb webs.They have air sensitive hairs, a silk producing plate and a calamistrum, which is a comb for reefing out this silk. Cribellate silk (sometimes called hackled silk) is feathery and rather fuzzy. The front legs of the Uloborids are generally long, often longer than the entire length of the body. There are two subfamilies, the Uloborinae and the Miagrammopinae (whose webs are reduced to a single strand). The Miagrammopinae are found mostly in well-forested areas and have only 4 eyes. The introduced Zosis geniculatus is common in houses on ceilings, under eaves, under the house and in garages or sheds. It can be identified by its banded knees and pink, ninja-star-style egg sacs. A colourful small Miagrammopes species. This spider was collected mid August 2009 on the northern side of the junction of Fish and Enoggera Creeks, Walton Bridge Reserve, The Gap. Body length: 4.5mm. The very thin and long body and first legs extended forwards are characteristic of this genus. A slender and attractively coloured Uloborid quite common in the rainforest at Mount Glorious. These are cribellate spiders, meaning they have a cribellum to produce woolly silk which they comb out with the help of the calimustrum. Like some other spiders they resemble a terrestrial squid. A small Philoponella, probably undescribed, relatively common in grassy areas on rainforest margins in SE Queensland. 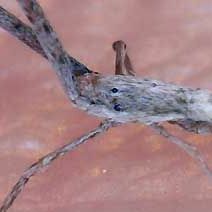 Female body length 3-4mm, the male 2-3mm. Collected on the creek near the SOWN shed, Paten Park in mid August 2009. Body lenth about 4mm with the front legs as long again, if not longer. Zosis geniculatus is common and easy to recognise. As it is venomless it is a harmless method of controlling insects in your house. It creates a ragged blue grey circular web, with star shaped egg sacs. Insects trapped in the web are rolled with the hind legs and wrapped in silk. The bundle is eventually carried to the hub of the web and sucked dry.